In 1989, as we entered the last decade of the twentieth century, Mumbai Educational Trust (MET), seeking to redefine the matrix of teaching - learning processes was launched. Its sole mission was to shape professionals who would lead the corporates and the society to the commanding heights. A dynamic scholastic platform was visualised anticipating the competency challenges of empowering the millennials with all-round excellence besides ITES for market dominance. The institutional fabric was woven around world-class infrastructure with affordability. The soul of this unique institution has been the passion of the Founder Chairman, Shri. Chhagan Bhujbal. 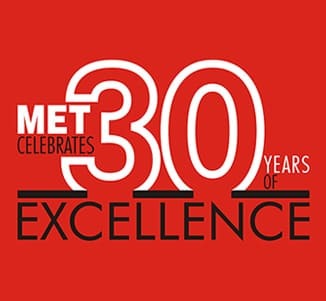 The last three decades of MET have been a unique journey led by the Trustees and the core team of professionals as they synergized conventional pedagogy with the modern technological inputs. Across the standard verticals of Management, Mass Media, Pharmacy, Information Technology, Engineering, Architecture, International Studies as well as Cambridge education school, interactive experiential academics were structured and delivered. All these programmes have since been driven by the mission of facilitating the youth’s ascent from awareness to knowledge, to learning, to wisdom and enlightenment. At the MET Bhujbal Knowledge City Mumbai and Nashik campuses the bouquet of programmes covers the entire range of studies from KG to PG and Doctoral Studies. As MET Celebrates 30 years of academic excellence, the above campuses with thousands of students, faculty and staff, are buzzing with events, workshops, celebrations marking the glorious journey thus far.